Northern California’s 4 and 12 hr run, ride and paddle adventure races. 4 hour and 12 hour events. 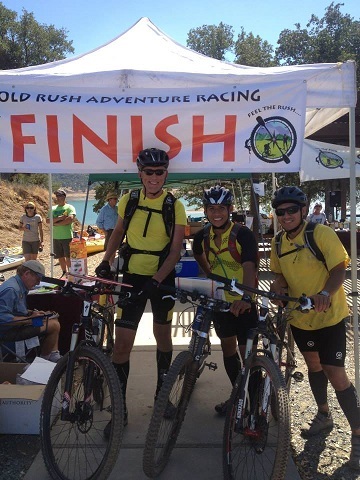 Congratulations to all 35 racers who tackled the Gold Rush AR Summer Challenge 4 or 12-Hour courses yesterday. It was a blazingly hot day which made the race even more of an adventure--so kudos to everyone who got out there on all or part of the course! Thank you to our race prize supporters: Peets Dryers, Tiger Balm, KT Tape, Mammut, Sock Guy, The Right Stuff. And as always, thank you your dedicated Gold Rush team of volunteers who made all parts of this race possible. We loved seeing everyone's happy and sunblocked faces after the race and hearing your stories. We hope you are all rehydrated and that your body temps have returned to normal--and that you're all now ready to join us in November for the Cold Rush! (Watch this page for upcoming details) Follow us on Instagram 'goldrushadventureracing' to see finisher photos! The 2017 event was held on June 17th based at New Melones Lake in the Sierra Foothills. The event started at 8 am for both the 4hr and 12 hr events. In both events the course is planned to have approximately equal segments, by time, of paddling, biking and run/hike.